Every year, an internal committee revamps the content of our online educational product, Secret Sauce. The goal is to improve content quality, delivery and re-align with company goals. However, in the past, this process has lacked structure and therefore produced poor results. This time, we needed to build thoughtful content strategy and execution. In 2017, I led the revamp with a clear content strategy that addressed user needs and company goals. I led user research, designed the information architecture and content structure, and worked with the product team to make UI changes. As the project lead, I built with a committee of 8 members, managed the timeline, deliverables, company-wide communication and meetings. It is the first thing that orients new Spoon members to Spoon University, set expectations, explain chapter structure and their role's responsibilities. During check-in calls, community managers were verbally communicating tactics and strategies that student leaders should know from their Skills training. The better we train the members, the higher the quality of content they will produce and readership they will grow — which equals less internal QA work. In the past, the team dove into the Skills revamp with a lot of assumptions about what needed to be fixed without research validation. Since we had very limited time to conduct research and an accurate data set would require a large number of respondents, I decided to build a Typeform survey. I also looked into past surveys we've conducted that were still relevant. 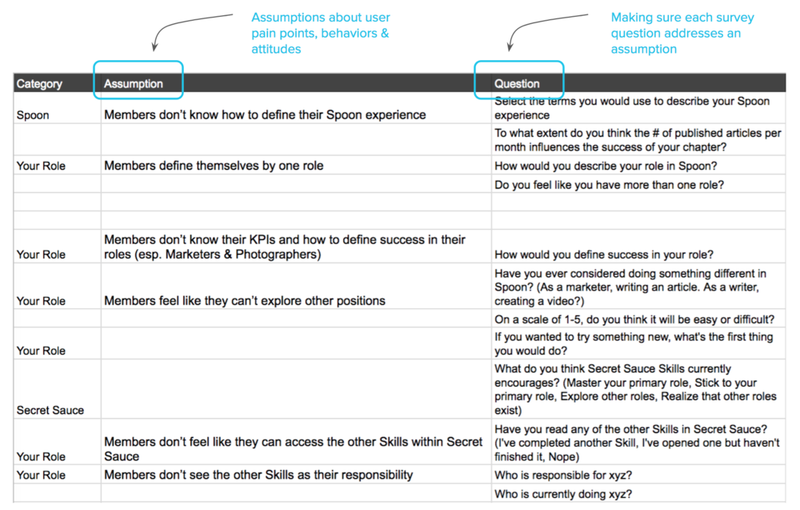 To evaluate the current success of the Skills, I created a list of assumptions about how our members perceived their roles and expectations, and how well Secret Sauce was meeting their needs. Each survey question was designed to answer an assumption. Because it's difficult to convince members to complete surveys or research calls, the survey was emailed to the entire community and ultimately completed by 151 total members. We are not successfully setting expectations for certain positions in the Skills. Members don't know what other teams within the chapter are working on and don't know how to evaluate the other team's responsibilities and goals. All students identify as content creators and distributors. Students prefer visual and tactical learning. Students find examples, pre-made templates and stories from other successful chapters helpful. But the resources are not findable enough. Since it was clear that the students' metrics of success did not match up with the company, I created user archetypes, outlining their tasks, skills, objectives and the KPIs we would evaluate. This helped my team understand who they are creating content for and why. There were 3 main objectives behind the content strategy for the Skills section. Align the information architecture and content with our company goals. Ensure the content is providing the right information in the right format. Create a consistent brand style, language, image-to-ratio text and systematize it so it's easy for the committee to execute. We wanted to make sure that every single member of Spoon identified as a content creator and a content distributor. Marketers were exceptions because they were managing content distribution from chapter social media accounts. I broke down each position into 4 types of skills to systemize the structure. To further systemize the way we approach each position, we divided the content into three parts. Context explains a concept, role, structure, timeline, expectations. Tactical teaches an action to achieve a goal. Strategy teaches a plan of action or equips students to create their own plan of action. To streamline our branding and voice, I created style and voice guides, a glossary and templates for different types of pages. Our research and personal team experience taught us that our current Skills were too conceptual so we added tactical examples and demos. Annotated examples break down deliverables and create a common Spoon vocabulary. GIF demos make certain tasks self-explanatory. I worked with our designer and CTO to incorporate visual elements, because we knew that 1) students became bored of infinite text and 2) certain concepts were not as effectively communicated through words. I collaborated with our designer and CTO to make visual changes to the Skills content to make the information more digestible and legible. Before there was a title header size, H3 and H2 and the font weight was distracting. We streamlined to a smaller title header and H3 and H2 are the same font size, but are either blue or black. We added two features to solve for the fact that certain information was getting lost in the text. For example, there were numerous links to pre-made templates within the Skills that 30% of our students didn't even know existed. Buttons serve as calls-to-action and easy access to resources and templates. This was the first time I had project managed and led content strategy for a product. There are so many things I'd like to dig into further to improve the way we train new members. Here are some of my learnings and musings for the next "revamp." The difference between tactical and strategy was a little confusing for my team. The lines were getting blurry and even I had a difficult time discerning between the two sometimes. Although it was better to have these guidelines than not, what is a better way to define the position structure? There probably was not enough research done on the context in which students completed their Skills. In the future, I'd like to learn more about the user journey for new members and look into the analytics of how much time is spent on different Skills and pages. Are cards the best UI for this platform? Is there a better way to prioritize the information for the user and provide an overview of progress? Do students find this current delivery overwhelming? How effective are the quizzes in helping students retain information?